I’m a fan of guided day tours for a couple of reasons: you get to meet new people, you’ll get an informed explanation of what you’re seeing and there’s a pretty good chance that everything will go smoothly and you’ll get back to your hotel in one piece. If I’m taking a guided tour, it’s for something that I’d rather not try on my own: ice climbing, caving, overnight hikes, etc. However, my preferred method of travel is at my own pace, with or without company. There’s so much to see in Iceland and, while I loved the tours that I did, I was ready to get out and do some exploring on my own. I rented a car early on Saturday morning and, based on the recommendation of one of my tour guides, got the GPS navigation. “But there’s only one road,” I said. “Trust me—some of the waterfalls and sights are not obvious. Plus, you don’t speak Icelandic,” he replied. True enough. I was glad for the GPS in the end, mostly because it gave me a sense of security that I wouldn’t detour off onto a country road looking for yet another waterfall and be stranded for days, ending up a popsicle. Plus, the GPS had several “driving tours” already programmed in, so there was even less chance of me missing something. Near Selfoss, a town on the ring road near Reykjavik. 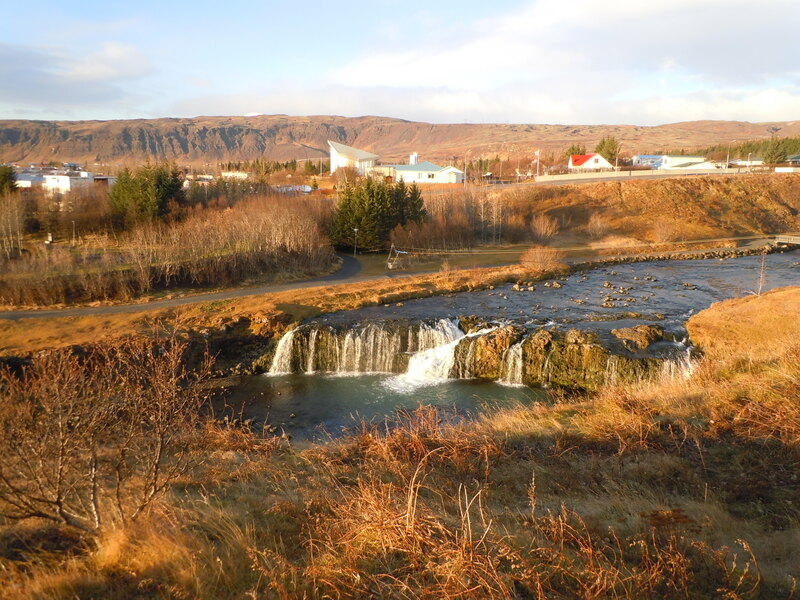 Though there are a million guided tours of the Golden Circle, I wanted to do this bit on my own, mostly because I wanted the freedom to spend as long—or as little—as I wanted at the three major sites: Þingvellir National Park, Geysir and Gullfoss. You can see the entire loop on your own in about 6 hours round trip from Reykjavik, which isn’t too bad, especially if you consider the fact that in November, the sun shines for about seven hours. My plan was to explore the Golden Circle then head south and east to Vík for the evening. First stop: Þingvellir National Park. The site of Alþingi, Iceland’s parliament founded in 930, Þingvellir is more than just a historical site. The park itself is huge, with lakes and wide stretches of plains and very few people. The information center, where many of the tour buses stop, have a short walkway that allows you to gaze out at the vastness in front of you. If it’s windy, as it was when I was there, you can also try out your Weather Channel hurricane pose. You know the one: leaning at 45° to the ground, attempting to keep your feet? 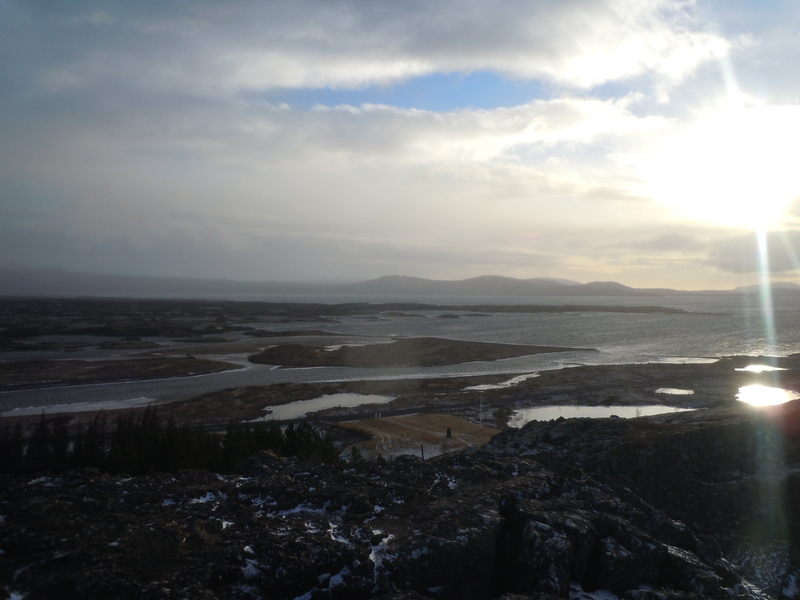 Þingvellir is a place that I wished I had a bit more time to explore—on a day slightly milder day. However, I got to experience a bit of that during my Silfra snorkeling experience so I fought my way back to my car and settled for the amazing views from my driver’s seat, stopping often to try to capture the landscape or the picturesque herds of Icelandic horses. Note: these horses know they’re awesome and only respond to “here, horsie horsie” with thinly veiled disdain before returning to their munching. Next stop: Geysir. The geyser for which all other geysers were named, this area is clearly visible from down the road for two reasons: the steam rising in great clouds from the earth and the giant brown lodge on the opposite side of the road that says “Geysir” in giant letters. Don’t get pulled into the lodge unless you’re looking for lunch or more souvenirs. Instead, cross the road (look both ways unless you want to get creamed by a bus of Japanese tourists) and head up the hill. Proving that there’s one in every crowd, the path is marked with signs in various languages warning tourists that the water bubbling from the earth is boiling hot and will burn you if you stick your hand in it. Of course, I saw more than one person bend down to test it first-hand. 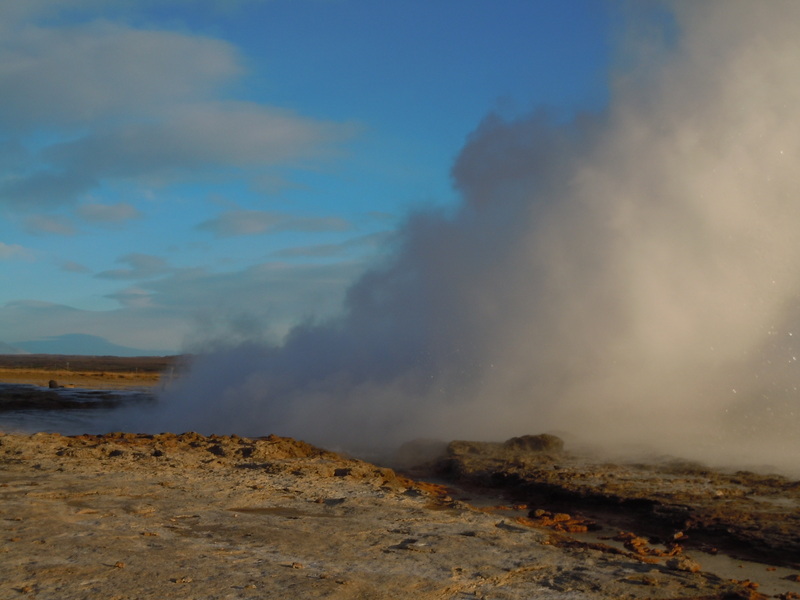 While Geysir is the one that most people flock to see, Strokkur is the best bet for actually seeing a geyser perform as it erupts about every five minutes. As one friend told me, if you’ve been to Yellowstone, it’s not that impressive. I haven’t been to Yellowstone yet, so Strokkur was pretty darn cool to me. Next stop: Gullfoss. This massive double waterfall was the highlight of the Golden Circle for me as it’s even more impressive than I imagined. There are two parking lots: one upper with the requisite café and souvenirs and a lower lot that is just a parking lot. If you don’t mind stairs, park in the upper lot and walk down the wooden staircase to the lower vantage point. There are several information boards detailing the geological and social history of Gullfoss, which are worth checking out. A paved walkway will lead you along the side of the cliff towards the waterfall for a closer view, but waterproof pants and a jacket are recommended, as the spray is quite forceful. As a result, your camera lens will get sprayed. Also, due to the natural reaction of water meeting freezing temperatures, the sidewalk may be transformed into a veritable ice-skating freeway. Take precautions and don’t look surprised if your slick-soled loafers don’t afford you any purchase. Drawing on many years of experience living in Colorado, I chose not to venture out to the farthest point and contented myself with the awe-inspiring view and infinite rumble of the falls from a non-slippery point. Climbing back up the wooden staircase, take the right hand path for a higher vantage point on the walkway that snakes around the curve of the cliff. The spray throws up rainbows almost constantly and this is a great location to capture them. Gullfoss was my last stop on the Golden Circle; it was a great ending to that loop. Now, I may have gotten more background information by being on a tour, but by going on my own, I was able to spend time where I wanted and, by luck, I avoided most of the buses. Tags: Þingvellir, Geysir, Golden Circle, Gullfoss, Iceland. Bookmark the permalink. It was so nice to have many of the sights to myself, even if it was a bit disconcerting to be the only person on the road for miles on end! Thanks for reading! Charles, the short answer is–how long do you want to spend at a destination? Technically, I think you could make it with 24 hours non stop driving, but that won’t be a pleasant experience. I would guess, roughly, with stops to explore, that 10 – 14 days would allow you time to see many of the “sights” and explore the island with a few activities thrown in like glacier climbing, hiking, etc. I spent 8 days there and it wasn’t nearly enough. I hope this helps! Fantastic stuff, Katie. I just returned from Iceland on March 17 after being there for about seven days, and I maxed out my days on guided tours. The two bookend tours – one up in Akureyri / Lake Myvatn and the second that was an 800km one-day, 16-hour trek from Reykjavik to Jökulsárlón (which was fantastic!) were the best with a big bus tour (first time in Iceland) in the middle – not so good, but did get me to the Golden Circle, and I would definitely drive next time. 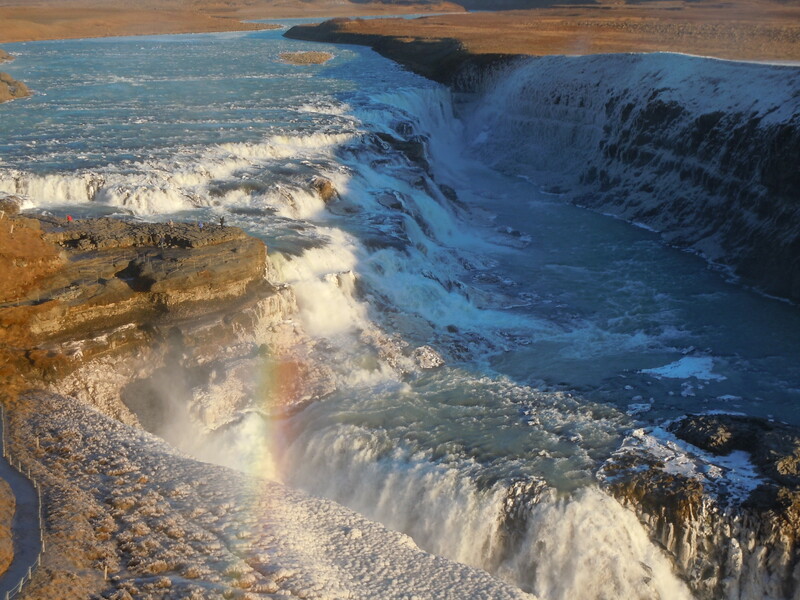 I hate people telling me “time to go – 20 minutes is enough for Gullfoss” (no it isn’t). While I am nowhere near as well traveled as you, I will go back to Iceland this year if I can. I went in bad weather, unfortunately, but even in that – Iceland is truly a land of wonders. BTW, make it up to Akureyri and Lake Myvatn if you haven’t done so – truly was a great surprise. Lake Myvatn has some fantastic pseudo-craters, and of course the natural hot springs. Time to go is winter when this region is at its best – stark contrast between the snow and the hot springs. Here are my photos out on Flickr (see link below). Hope you like – am still editing and adding names to pics, but they get my love for Iceland across. Love your blog here. Am bookmarking. Hi Katie – I came across this blog whilst researching my upcoming trip to Iceland. I’m also going to be driving this portion of the ring road (from Reykjavik-Golden Circle-Vik-Jökulsárlón) on my own in April … what sort of car did you hire? Is a normal 2WD OK or would you recommend a 4WD? Hi Gaby–Oh, you’ll have such a good time! I had a 2WD with decent tires–which makes all the difference. I don’t think you need a 4WD, but make sure to check out the tires first. I didn’t have any problems until my last night when a snow storm came in. I live in Colorado, so I’m accustomed to driving in snow, but it was still a bit hairy. If you’re more comfortable with a 4WD, I would spring for it. But, whatever you choose, make sure that there are decent tires. Have a great time!